These areas normally include bays and the water between islands or between the islands and the mainland. With some exceptions, internal waters are considered legally equivalent to rivers and lakes, which means the country has total control here. 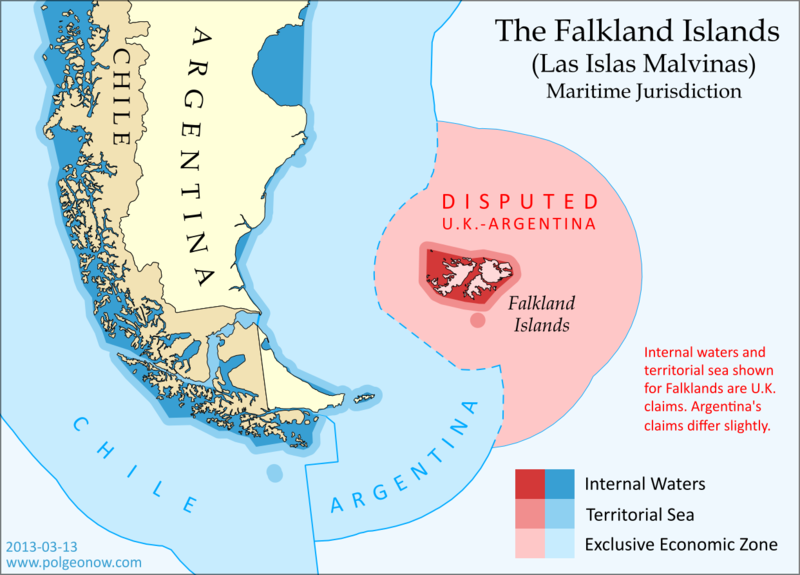 Both the U.K. and Argentina claim an area of internal waters in the Falklands, though their claims are slightly different. Only the British claim is shown on the map above - the Argentine claim is a bit smaller, excluding the channel between the two main islands but stretching farther out to the most distant rocks. The territorial sea is an area stretching up to 12 nautical miles out from the edge of the land or internal waters, which is considered sovereign territory of the state (i.e. an actual part of the country), though the "innocent passage" rule requires that foreign ships still be allowed to sail there without permission. Both the U.K. and Argentina claim a 12 nautical mile territorial sea surrounding the Falkland Islands. The two countries' claims are slightly different because they're drawn from the edges of the differing internal waters claims. The U.K. claim is shown on the map above (the small circle at the bottom is the territorial sea around Beauchene Island). Although the waters beyond the territorial sea are not considered part of the country itself, the country still has some legal rights over the surrounding ocean, up to a maximum distance of 200 nautical miles from the coast or internal waters. This is called the "exclusive economic zone", and here countries can control the harvesting of resources, scientific research, and environmental protection. When two countries are less than 400 nautical miles apart, they have to come to an agreement about where to draw the border of their EEZs (the default is normally to draw a line halfway between the two coasts). The Falklands are indeed less than 400 nautical miles from mainland Argentina, but the Argentine government doesn't consider this to be a problem, because they consider both the mainland EEZ and the Falkland EEZ to be theirs. The U.K. also claims the waters around the Falklands (though it calls them a "fishery conservation zone" instead of an EEZ), but draws its line short of the halfway point between the islands and Argentina. This might be intended as a show of modesty, though Argentina isn't flattered, since it doesn't think the U.K. should be there in the first place. Beyond the end of the EEZ, countries are also allowed to claim economic rights to the seafloor (but not the water above it), if it is part of the "continental shelf". The legal definition of this term is a bit different from the way geologists use it, but the basic idea is that if the continent or landmass extends out a ways underwater before giving way to the deep sea, the shallow area is the continental shelf. This is limited to 350 nautical miles from the shore, as well as detailed rules defining the required depth and slope of the sea floor. But since the U.K. and Argentina both also claim South Georgia and the South Sandwich Islands (not to mention parts of Antarctica), their conflicting continental shelf claims continue southeast from the Falklands EEZ for hundreds of miles. If you're interested in this extended disputed territory between the U.K. and Argentina, check out this excellent online map made by Durham University's International Boundaries Research Unit. Who Really Controls the Seas of the Falkland Islands? Actual control of these seas follows the U.K.'s claims, since that's the country that actually controls the islands. Argentina insists this is illegal, and even temporarily occupied the islands in 1982; but it's unlikely control will change any time in the near future, since the U.K. insists it won't go against the will of the islanders (most of whom are proudly British, and many of whom have bad memories of Argentina from the 1982 war). Graphic of the Falkland Islands flag is in the public domain (source).